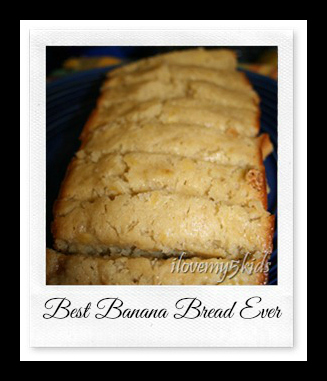 BEST BANANA BREAD ever, seriously!!! You are here: Home / Easy Breads / BEST BANANA BREAD ever, seriously!!! So, then I searched the name of it and found my sweet friend had posted it. Her site has tons of yummy recipes but this one is now my hubby’s favorite. If you are looking for some family friendly recipes – check out, Jaime Cooks it UP! Adapted from Jaime Cooks it UP! 2. Add the eggs, bananas, buttermilk and vanilla. 4. Add the dry ingredients to the banana mixture. 5. Mix until just combined….don’t over mix. 6. Grease loaf pans generously. I use the Spray Pam with Olive Oil – makes me feel more healthy. 7. Bake for 55 minutes at 350. I just have to keep checking it using the toothpick method. When it starts pulling from the pan then you kind of know it is about to be ready. 8. Cool on a wire rack or just dig into it when it is warm. The owner and writer of this blog cannot be held responsible for bigger pants sizes needed. Ooo, this looks so tasty! Thanks for stopping by the Homestead Blog Hop! Mmmmm… I am going to try this and give it as a gift to my daughters bible school teacher at church! Yum! Ooooh, all that gooey butter–I love it! I’ll have to hide a few of the bananas I just bought so I can make this up this weekend. Thanks! Tasty! We make banana bread all the time. I will occasionally chop some chocolate and add that, too. Thanks for sharing. Sounds yummy. We’ll have to give this a try! Cool blog as for me. It would be great to read something more about this theme. Thanks for posting that material. I love banana bread! I’ll have to try this one out. 🙂 Thanks for sharing. I love Jaime Cooks it UP! I love banana bread and will definitely have to try this recipe out. Thanks!